The Celebrating Our Faiths program celebrates the incredible diversity of faith traditions within Edmonton. Each month a different faith launches an educational event to showcase their faith tradition. A permanent exhibit in City Hall's City Room changes to provide an opportunity for Edmontonians to learn about each of these faiths. The Celebrating Our Faiths display is located on the main floor of City Hall. A multi-faith display highlighting the faith groups represented by the Edmonton Interfaith Centre for Education and Action. The display celebrates World Interfaith Harmony Week which is based on a United Nations Resolution for a worldwide week of interfaith harmony. The World Interfaith Harmony Week falls on the first full week of February each year. 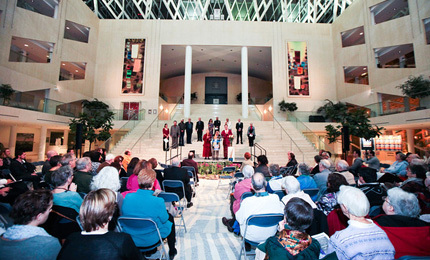 The "Celebrating Our Faiths" program is a joint program between the Edmonton Interfaith Centre for Education and Action and the City of Edmonton. This partnership began in 2006.